The Show will include Saturday evening Camping with live music by "PEDLAR" and Clubhouse bar. 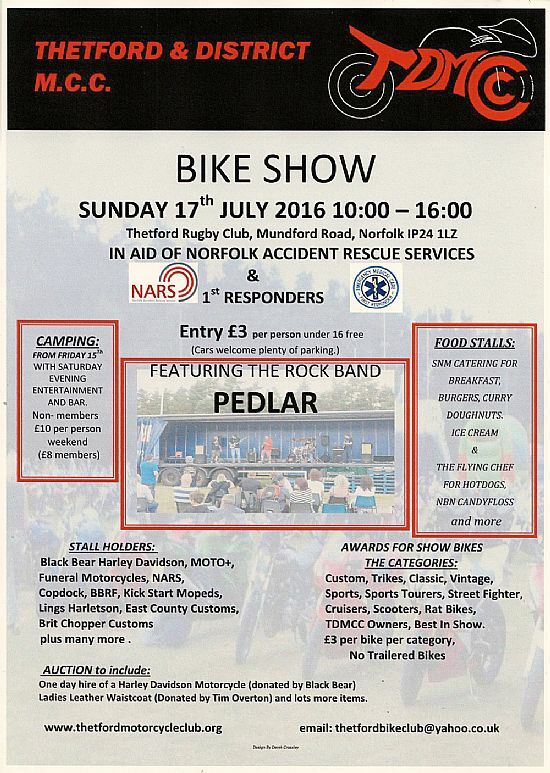 Anybody interested in exhibiting or trading at the 2016 show can get in touch via the normal club email address: thetfordbikeclub@yahoo.co.uk or contact the Club Chairman, Dennis on 07747 046296. All vehicles and bikes entering the show and grounds enter at own risk. No camp fires, BBQ to be only lit in BBQ area by clubhouse. Camping wristbands must be worn at all times.